Co. Wexford: Ambrosetown, Ardcolm (2), Bannow, Kilpatrick, Killurin (2), Kilmore (2), Lady's Island, Mayglass, Mulrankin (2), Roslare, Rathaspick, Tacumpshin, Taghmon (2), Wexford (6). The Board also included 8 ex-officio Guardians, making a total of 32. The Guardians met each week on Saturday at noon. The population falling within the Union at the 1831 census had been 48,802 with divisions ranging in size from Tacumpshin (population 1,658) to Wexford itself (12,735). The new workhouse, built in 1840-42, occupied a 7-acre site at the north-west of Wexford, and was designed to accommodate 600 inmates. Its construction cost £5,780 plus £1,120 for fixtures and fittings etc. It was declared fit for the admission of paupers on 2nd July 1842 and admitted its first inmates a few weeks later on 25th July. The site location and layout are shown on the 1925 OS map below. The buildings followed Wilkinson's typical layout. An entrance and administrative block at the south contained a porter's room and waiting room at the centre with the Guardians' board room on the first floor above. The three-storey main accommodation block housed the Master's quarters at the centre, and male and female wings to each side. Wexford main block from the east, 2000. Wexford main block entrance, 2000. 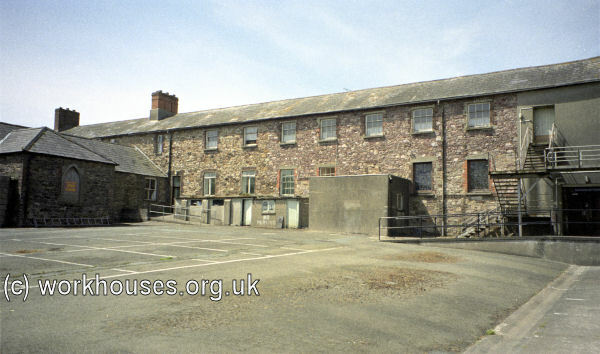 Wexford rear of main block from the north-west, 2000. 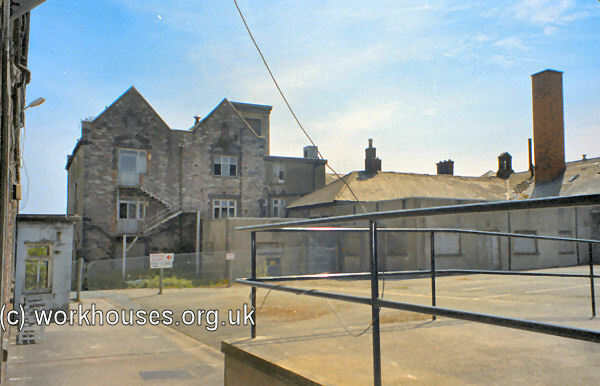 Wexford infirmary block from the north-east, 2000. 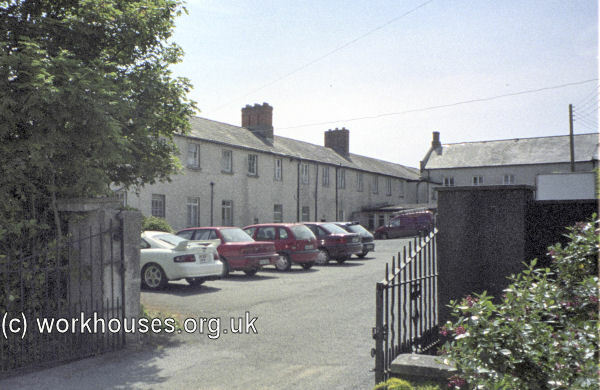 Wexford rear of infirmary block from the north-west, 2000. At the 1901 census, the population of the Union was 32,839 with 11 officials and 311 inmates in the workhouse and fever hospital. The site is now known as Wexford General Hospital. 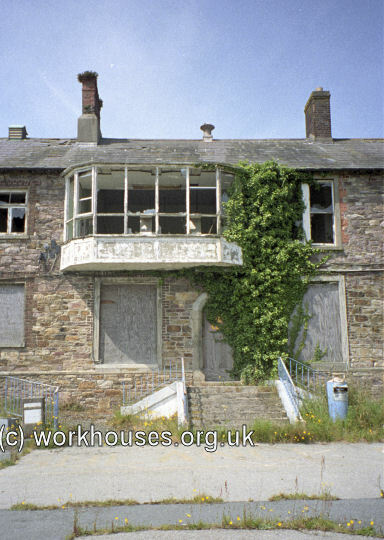 In the first phase of a major rebuilding scheme, services formerly based in the old workhouse buildings were transferred to new accommodation in 1992. 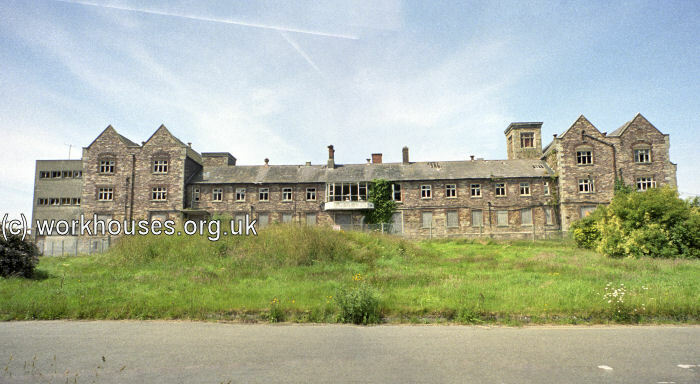 At the time of writing, the workhouse buildings are lying derelict, demolition plans having been the subject of some local opposition. Hidden Wexford Genealogy had transcription of workhouse births 1851-93.